Christmas is coming! Travelling during the holidays can be stressful but if you plan ahead then it can be the perfect time of year to travel. Some of the best places to visit in December in the world might surprise you – there are plenty of destinations you’ll be adding to your December travel bucket list! December is one of the best times of year to travel whether you love to discover how other cultures celebrate the festive season or you’re trying to avoid Christmas altogether! There are hundreds of places to visit in December that you’ll fall in love with, but we’ve narrowed it down to the top 8 to make your vacation decisions easier. Check out the best places to visit in December and let us know if you decide to stick with some cold winter fun or escape to a sunny beach somewhere! READ MORE: The Best Places to Travel in January! Whether you’re into jumping around in the snow and looking out for Father Christmas, or temple hopping and swimming in waterfalls, we’ve got you covered! Click on the table of contents to take you the specific destinations you’re interested in. Or, you can browse through the whole list and take your pick from the varied places around the world! Don’t forget to check out our accommodation recommendations too. 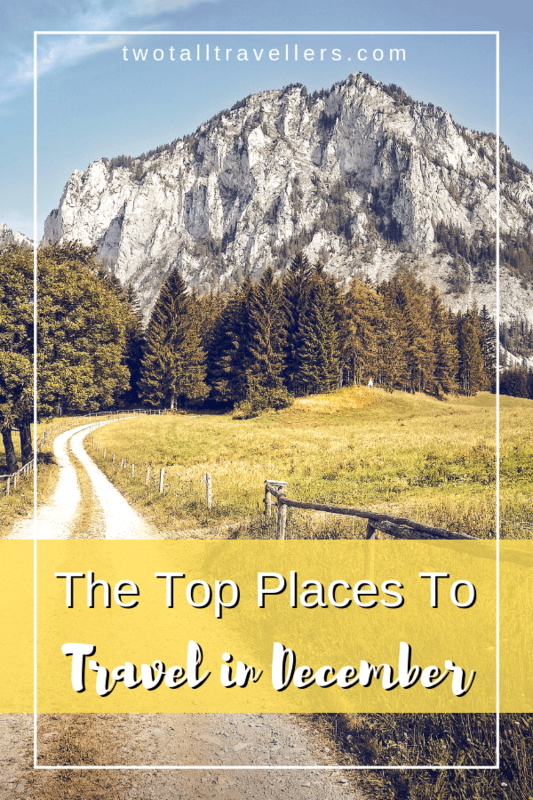 We always use Booking.com to find the best deals on hotels, hostels and apartments so we’ve shared some great options from them. Christmas Island, an Australian External Territory is an eco-travellers paradise. Home to several endemic crab and bird species, the Island is over 65% National Park, is surrounded by amazing diving opportunities and is home to less than 2000 people. 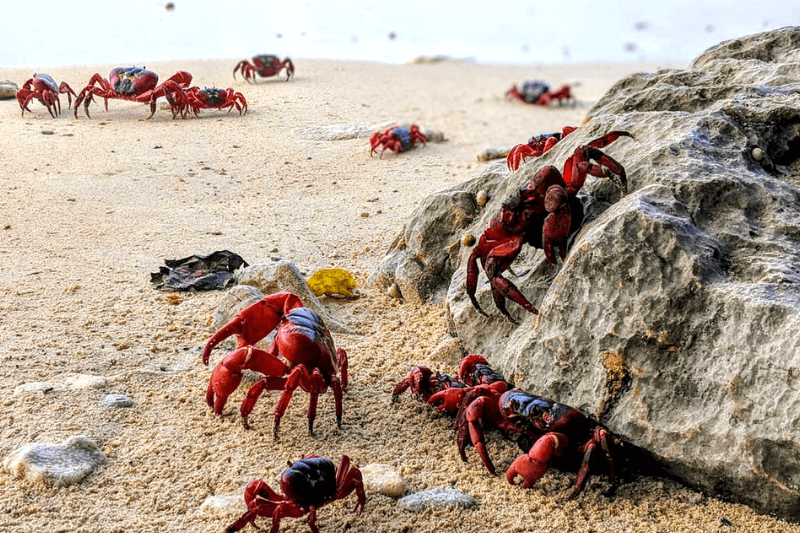 Whilst it is beautiful to visit at any time thanks to it’s tropical, year round climate, if you really want to see something special, visit in December when you will have a chance to witness 50 million red crabs migrating from the rain-forest to the coasts to mate and spawn. David Attenborough described it as one of the most spectacular migrations on the planet, and he was not wrong. The migration closes almost all roads on the Island (and there are not many to start with!) as locals and visitors give the crabs the space to what they do naturally. It is truly and incredible sight and one I was incredibly lucky to witness. If you’d like more information about how to plan a visit to Christmas Island and see this incredible natural wonder for yourself, this guide has everything you need. Try something different this year and experience a sunny holiday in December! See more from Make Time To See The World on Instagram and Facebook! 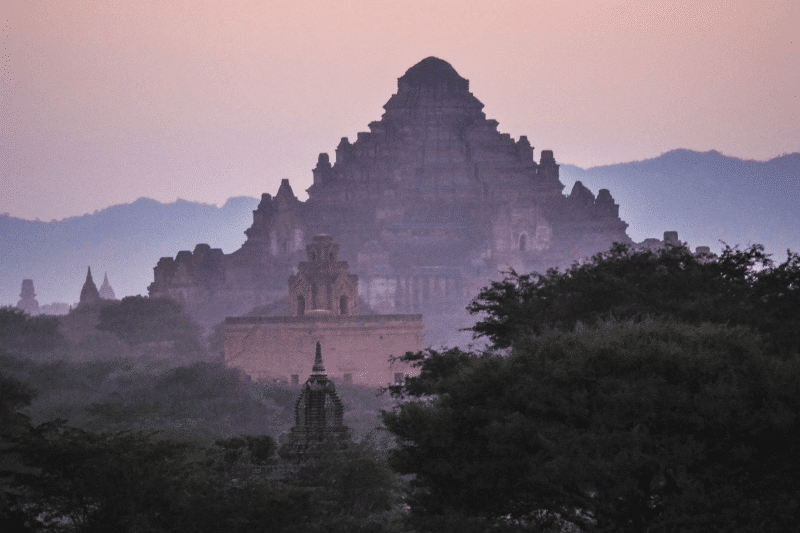 One of the best places to visit in December is Bagan in Myanmar. And that is because of three very important reasons – the weather, the balloons, and the photographs. December is a particularly pleasant time in Bagan. The weather is mild with temperatures ranging between 15° – 25°C. Days are sunny but not hot. You can escape the wetness of rains as well as the scorching heat of summer: a perfect time to explore. Imagine exploring this ancient city! Bagan has a short ballooning season from October to April with December being quite popular. Cooler temperatures and calmer winds ensure that you can float closer to the temples and get a detailed look. December also comes with multiple layers of fog during dawn and dusk. If you are looking for that perfect picture of Bagan enveloped in a shroud of mist, December is the perfect time to go. Home to more than 2000 ancient temples, Bagan is one of the most mesmerizing, yet relatively unexplored, archaeological sites in the world. Many of these temples contain well-preserved frescoes and carvings that are a treat for sore eyes. It is easy to get lost in the beauty of Bagan – it really is one of the best places to visit in December. See more from Stories by Soumya on the blog, Facebook and Instagram! 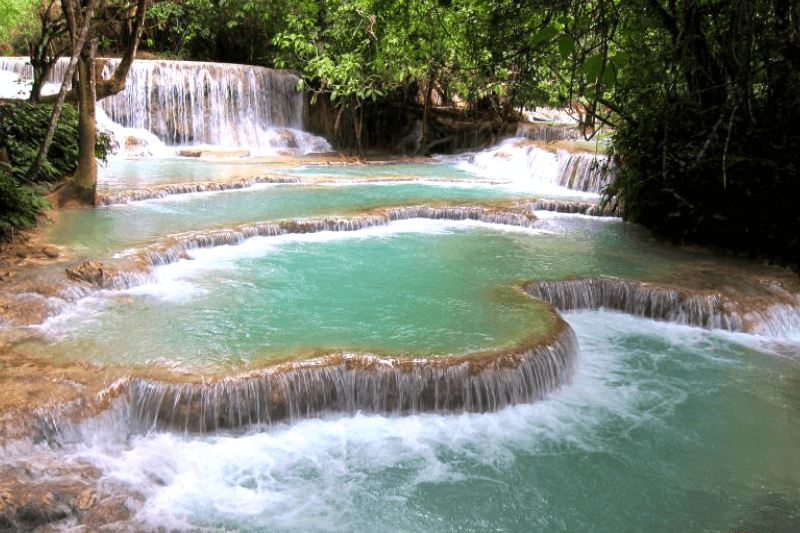 If you want a laid-back and relaxing country to have a vacation, then Laos is the perfect place for you. One of the best time to visit Laos is in December. The weather is perfect with the dry season and also has sunshine throughout the day. Temperatures range between 15-26℃ (59-79℉) depending on your location. It’s a popular place to visit so you will encounter larger crowds at the tourist locations but that shouldn’t deter you from visiting. these waterfalls aren’t a bad place to visit in December! Want to know where to go in Laos? Luang Prabang is a UNESCO Heritage site and is highly recommended with temple hopping and seeing museums, eating delicious street food, swimming in Kuang Si waterfalls, and more. If you like big cities, visit the capital, Vientiane, and relax along the Mekong River. We also can’t forget about Vang Vieng where you can de-stress along the Nam Song River, go caving, rock climbing, and encounter adventures. Have an amazing time in Laos, especially if you’re going to travel in December. See more from Life of Doing on Instagram and Twitter! 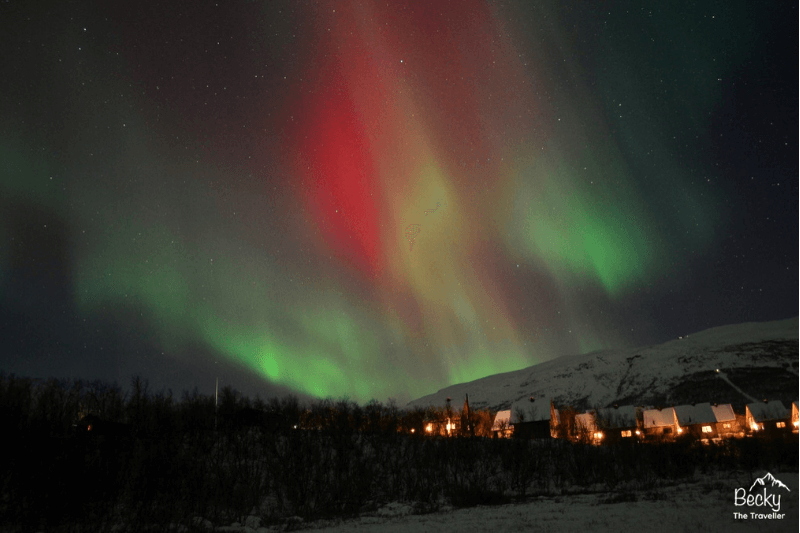 One of the best European destinations to visit in December is Swedish Lapland. Although the cities in Sweden are very pretty during the winter months, the best place to visit for a really spectacular experience is Swedish Lapland. In the far north of this Scandinavian country in the Arctic Circle, you’ll find a winter wonderland with snow-covered trees, frozen lakes and glistening icicles. But for me, on my Lapland trip, there was one thing I wanted to see, nope not Santa, although I did him too! It was the Northern Lights. imagine seeing this in real life! During the winter months, there are limited hours of sunlight, which means a greater chance of seeing the Northern Lights so that makes December the perfect time to visit Lapland. I spent five days in Abisko National Park which is one of the best places to see the Northern Lights due to the huge lake which creates a unique micro-climate. Abisko National Park is also stunning to explore during the daytime as well, with sledges and snowshoe tours there’s something for everyone. See more from Becky The Traveller on Instagram and Facebook! Are you looking for an off the beaten path destination that promises the culture of old Arabia, the amenities of a developed nation, multicultural culinary delights, and the luxury of world-class spa resorts? Then consider a trip to Doha, Qatar in the Middle East. Qatar is one of the safest Middle Eastern countries and offers lots of things to do for all types of travellers. Most of the tourist attractions in Qatar are concentrated around the capital of Doha. 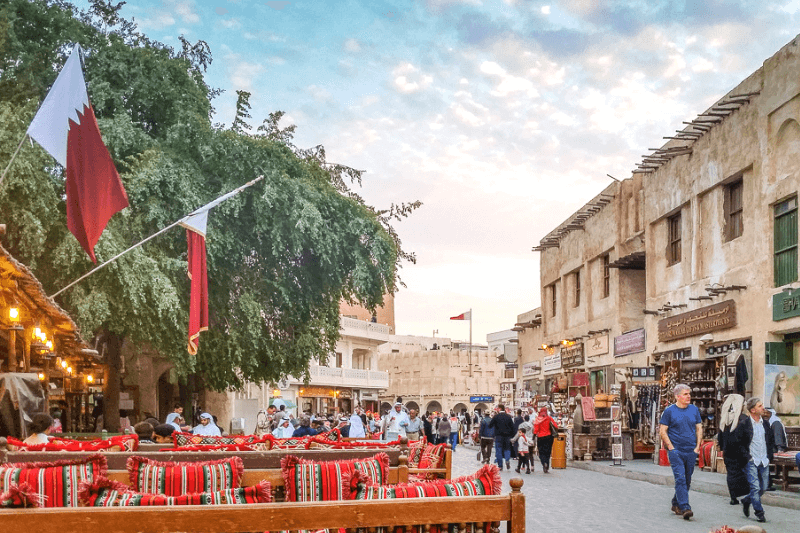 Doha is also perfect for a short or long layover; even with a day in Doha, you can take in the most popular sites of Souq Waqif, Museum of Islamic Arts, the Doha skyline and Katara Cultural Village. Qatar definitely looks like one of the best places to visit in December – look at the weather! For a longer holiday, you can indulge in dune bashing, visit the UNESCO Site of Al Zubarah, kayak in the mangroves or see camel races. December is perfect to visit Doha since the hot and humid summer comes to a close and the cool weather is pleasant enough to explore the desert environment. It really could be the best Asian country to visit in December! Centuries-old traditions and beautiful winter mountain scenery make the central European country of Austria one of the most magical and best places to visit in December. It starts with Saint Nicholas and Krampus making their rounds on or around 5 December. Saint Nicholas awards children for good behaviour while the devil-like Krampus scares the hell out of the naughty ones! Austria is especially famous for it’s authentic Christmas markets. Whether in Vienna, Salzburg, Innsbruck or a small village – Christmas in Austria is the real thing. In the beautiful setting of historic old towns, you can wrap your hands around warm mugs of Glühwein, taste traditional treats like Kiachl, listen to atmospheric music, and shop for original hand-made gifts. 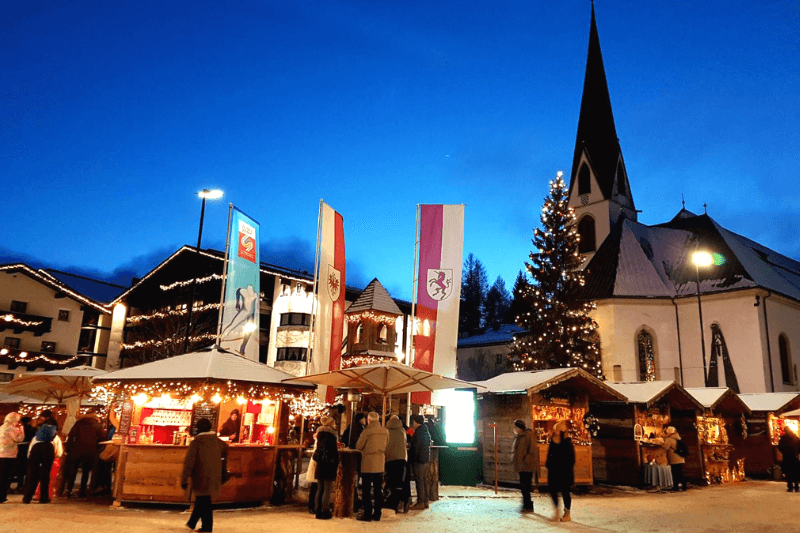 The Christmas market on the town square of Seefeld in Tirol, Austria in December. In the mountainous Alpine villages, skiing and other fun winter activities await in the snow. Or you can simply check into a spa hotel for some winter pampering. Whether you’re visiting with a family or as a romantic breakaway, there are many unique things to do in Austria in December to ensure an unforgettable holiday. Austria definitely is one the the best European countries to visit in December. Don’t forget too that you can click here for a Salzburg Card, which gives you FREE admission to the city’s main attractions and FREE transportation! Or, if you’re travelling to Vienna, click here for the discounts and free transportation card there. See more from Travel Tyrol on Facebook and Instagram! Back in 2014 I decided to travel on my first solo trip! I’d never done anything so adventurous so I wanted somewhere safe, quiet and cultured. I opted for Oslo, Norway, and December was the perfect time to be there! 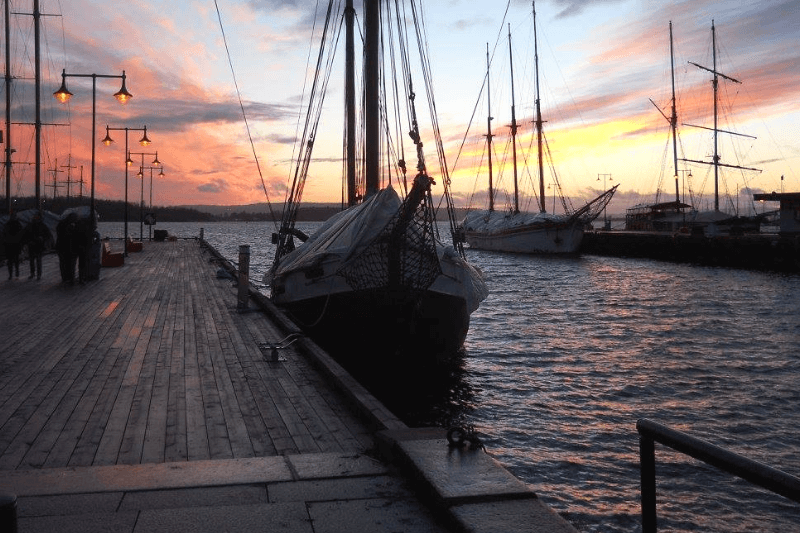 The city was also perfect for wandering and discovering beautiful architecture (I’m looking at you, Opera house) art in the Munch museum and Astrup Fearnley Museet, and the views of the harbour at sunset. But for me the absolute highlight was the Nobel Peace Prize museum. The Nobel Peace prize ceremony is held in December, so if you are lucky to be there, you may gain a peep of the celebrations. The year I visited was when Malala received her prize, and I was lucky to see her in person. The exhibitions there are a wonderfully poignant testament to the people being honoured. Oslo has a 24/48/72 pass that you can buy, which gives you free entry to over 30 attractions and museums, as well as FREE transportation around the city. You’ll even get discounts on your shopping and meals! Click here to get yours now. See more from Rachel On Route on Twitter and Instagram! December is my favourite month to be in New York City because it is a Christmas holiday/ winter-in-the-city fantasyland. There are three iconic ice skating rinks – Bryant Park (free with your own skates), Rockefeller Centre at the base of the giant tree, and Central Park with views of Midtown and the Plaza Hotel. After skating, do a self-guided tour of the department stores’ holiday windows. Start at Macy’s then pass the lions in front of the New York Public Library that are decorated with Christmas wreaths. 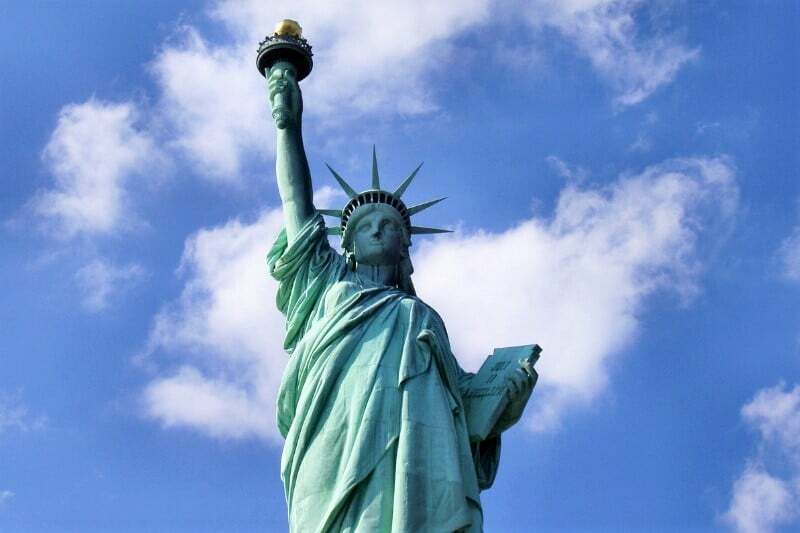 you can’t miss the famous tourist attractions in New York! 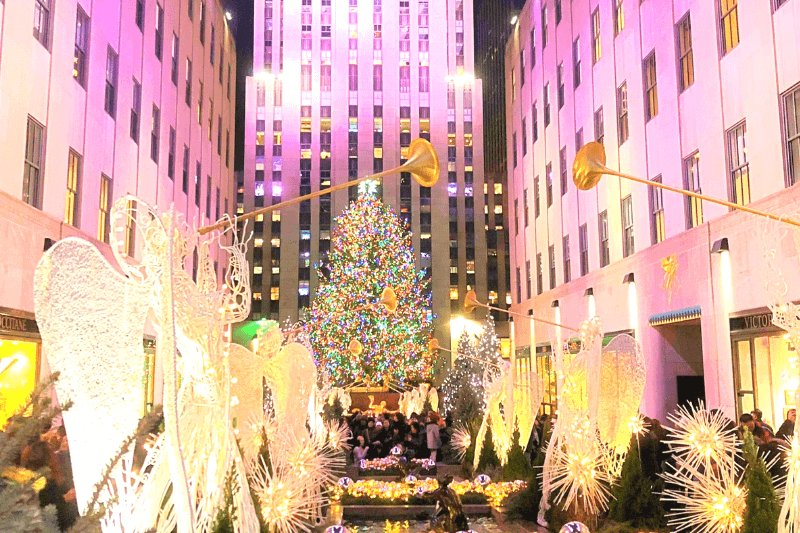 Walk up Fifth Avenue and see the enormous real Rockefeller Centre tree and enjoy the light show at Saks before seeing their windows. As you pass the Lindt chocolate store, pop in – they usually have free samples for the holidays. Finish at the over-the-top Bergdorf windows. The kids (or your inner kid) will enjoy another self- guided tour of all the Christmas trees. Washington Square Park, Madison Square Park, and Bryant Park all have enormous trees. The Natural History Museum has a tree that’s covered in origami animals. St John the Divine cathedral has a flock of origami cranes flying on and around their tree, and the Met’s tree is covered in angels. Then venture into Brooklyn for the crazy decorations in Dyker Heights, where neighbours all try to outdo each other with over-the-top lights and decorations. And, of course, don’t miss the annual Rockettes Christmas Spectacular in Radio City Music Hall and the Nutcracker ballet at Lincoln Centre. It’s impossible not to get into the holiday spirit in New York in December. See more from Travel Collecting on the blog, Facebook and Instagram! Are you planning a trip this December, or even next year? Let us know where you go in the comments!